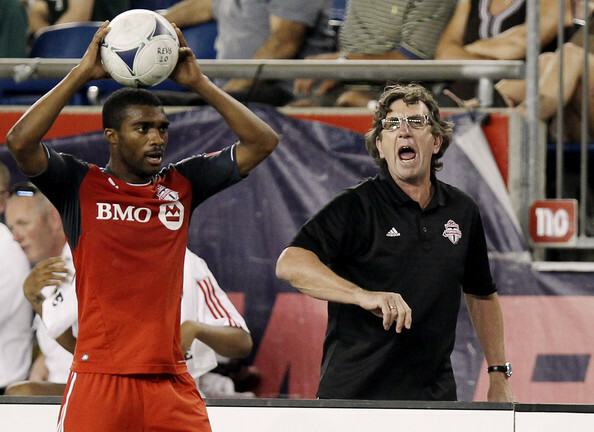 Home » Analysis & Opinion » Toronto FC vs New England Revolution: Home Opener! Toronto FC vs New England Revolution: Home Opener! TFC have a 5-5-2 record when it comes to home openers (the 2013 match at the Skydome doesn’t count as a home opener) – a nice balanced record – and winning in their home openers hasn’t necessarily been a harbinger of success for the coming season, though if we’re going to freeze it’d be nice if they won. Even though Toronto have only played the one game, they’re currently one of the top teams (wahoo!) due to their win against the Union in the match that kicked off the 2019 season. Of course one win means nothing in the marathon that is the MLS season, but it was a surprising win, and after last year we’ll take any bits of positivity that we can get. St. Patrick’s Day – expectations of drunken nitwits in a variety of green paraphernalia are high. Fingers crossed that they aren’t but I’m not holding out much hope. Jozy Altidore – Jozy’s been injured/recovering from surgery for awhile now. He missed the CCL matches, and TFC’s first match – chatter from this week’s training is that he could feature in today’s match. As much as I’d like to see him play, if he’s not 100% I say keep him off the pitch. It’s only the second match, it’s going to be cold, on a still not great pitch – why risk it? Goals – Michael Bradley can’t be expected to be the leading goal scorer, is Jordan Hamilton ready? Will Nick de Leon or Jonathan Osorio step up? Defense – wasn’t it nice to have Drew Moor to help organise the backline between Ciman and Mavinga? More of that please. Terrence Boyd – I get that he’s likely a bench player behind Altidore, but why not give him a start? The love club – speaking of Boyd, both he & Marky Delgado got engaged to their respective girlfriends during the break. All together now; AWWWWWW. Kick-off time – remember when this game was scheduled for the afternoon? The TSN overlords obviously decided that wasn’t going to work for them so night game it is. Fun. Bundle up – at the risk of sounding like your parent, dress warm! Layers are your friend, also don’t forget your gloves. This is not a T-shirt match. TFC have a slight edge in all time play against the Rev (5-3-5), with the matches rarely being low scoring affairs. Brad Friedal’s side if off to a shaky start after a draw to Mark Hinkley’s FC Dallas and then a loss to the Crew. Carles Gil (their shiny new Spanish DP) has scored the only goal for the opposition so far this season, he and Juan Agudelo are the players to watch, with Diego Fagundez (watch your mouth) as a still dangerous option. There’s also a bit of CanCon to keep an eye on in Tajon Buchanan, the young forward from Brampton has only featured in a brief sub appearance, but always nice to see Canadian players getting minutes. Toronto will need to be wary on the wings as the Rev have both speed and savvy in their attack. Should Toronto FC win today? Yes. Even without Jozy they’re the better side, they’re well rested and with last year (and this year’s CCL loss) kind of hanging over them like a spectre, they’re highly motivated to give the fans a win. So get your etickets ready (or your actual tickets if you’re one of the lucky ones that received their SSH package before tonight’s match), layer on those scarves and get ready for a new season – lucky 13! I’m feeling confident so I’m sticking with my 3-1 podcast prediction of a Toronto FC win. Let’s have a good one boys, and then we can pretend that last year was just a terrible mass waking nightmare, sound good to everyone? Excellent. Happy home opener all.